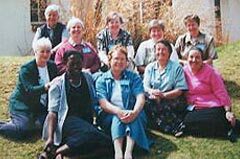 To share the Earth Story, exploring its implications for all creation and recognising its particular ramifications for us as a group of Mercy women. 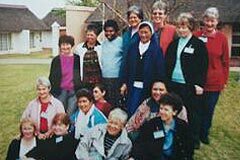 To learn about the reality or each of the areas where Sisters of Mercy live - Africa, Asia-Pacific, Europe, Latin America and the Caribbean and North America. To deepen our understanding of the process of globalisation and its impact on poor people and the environment, especially the role of transnational corporations and the mechanism of debt. To share information about how we are responding to the challenges of globalisation. To formulate action plans that can be implemented in each area. To work to strengthen the organisational structure and facilitate communication at the Geographic Area and International levels. 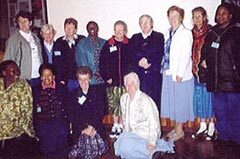 Sr Patricia Fox from Australia who attended part of the Conference as the Mercy International Association (MIA) representative and Sr Ethel Bignell as the MIA Executive Director. Wendy Flannery and Deirdre Mullan will be came from Mercy Global Concern (MGC). Adele Howard, Australia, gave input and training in information technology. (See Asia Pacific group photo, below). She is a member of the MIA Communications Group. Filip Fanchette from Mauritius also gave input. Our facilitators were Mary Waskowiak, North America and Goretti Rule, South Africa. 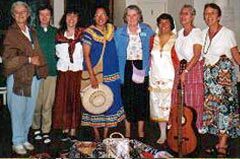 The translators were Cecilia Heduan from Argentina and Cait Wims from Peru (see the Latin America and Caribbean photo, below). Back from left: Mary Feane (England), Agatha Collopy (England), Mary De Largy (Ireland), Suzanne Ryder (Ireland, Focal Point Person), Patricia Mc Mahon (England). Left to right: Vicky Arndorfer (IOWA), Eileen Hogan (New York), Alicia Linehan (New Foundland), Gilmary Bauer (USA), Karen Donahue (Chicago, Focal Point Person), Tina Geiger (USA). Rose Palacio (Philippines) and Trinie Pangelinan (Guam) are in the Asia-Pacific Photo (above).